INCREDIBLE PRICE! Water views from the front and golf course views from the rear, this beautiful home has it all and the exceptional landscaping with curbing adds to the appeal. 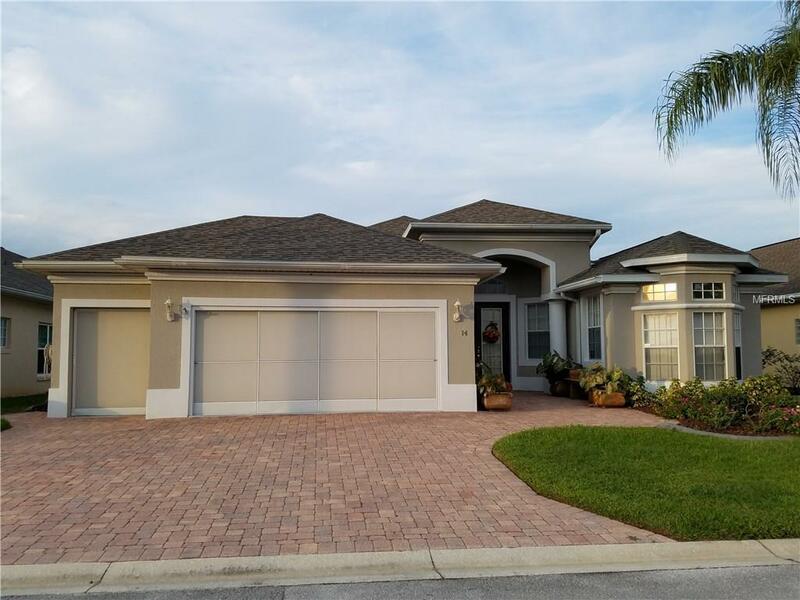 Double door entry, formal living and dining rooms plus a family room and a beautiful Florida room overlooking the golf course. Three bedrooms plus a den/office with bay window, and a two car garage + golf cart garage with screens, in addition to drop down stairs and AC storage in the attic. The kitchen has Corian countertops, 42 inch white cabinets, and stainless steel appliances. The spacious master suite has sliders to the lanai and offers TWO closets, one mirrored, and a lovely large master bath with garden tub, separate shower, dual sinks, privacy toilet and vanity. Interior & exterior paint was applied in 2017, new roof installed in 2015. Flooring is 3/4 inch bamboo in all rooms except kitchen & utility. The Florida room has a finished floor and vinyl windows. Extras include ceiling fans, plant shelves, trey ceilings in family and master bedroom. LOTS of living space here!! The High Vista clubhouse has a large ballroom, library, card room, fitness center, arts & crafts room and planned activities. There is also a unique pub and gameroom. Outside is a huge heated pool, hot tub and there are shuffleboard, tennis, bocceball & pickleball courts. The community is located near shopping, medical facilities, interstate highway, airports and restaurants plus all of the Orlando area attractions. MAKE AN OFFER.